Illinois Teen Driving Accidents and Recoveries | Hupy and Abraham, S.C. In 2013, teens aged 16 to 19 accounted for 10.1 percent of the incapacitating injuries and 7.2 percent of the traffic fatalities in Illinois, according to the most recent information available from the Illinois Department of Transportation. These statistics, while startling, do not account for all of the injuries or fatalities caused by teen drivers. While Illinois has one of the best records in the nation for teen drivers, teens still cause dangerous—and sometimes fatal—accidents on our roadways. Inexperience on the road and distracted driving are common reasons for teen crashes. Accordingly, it is important to know how to keep teens safe on the road and what to do if you or a loved one is hurt in an accident with a teen driver. A permit at age 15. At age 15, a person may apply for an instruction permit if that person has the written permission of a parent or guardian; is enrolled in an approved driver’s education course; and passes a written driving test and a vision test. A driver with an instruction permit must have a licensed driver over the age of 21 riding in the front side. Drivers with instruction permits are required to complete 50 hours of driving practice with at least 10 hours occurring at night, but they are not allowed to drive between 10 p.m. and 6 a.m. Sunday through Thursday, or between 11 p.m. and 6 a.m. on Friday and Saturday. An initial license at age 16. A teen driver who is at least 16 years old and who has had an instruction permit for at least nine months with no convictions may apply for an initial driver’s license. In order to get the license, all the following criteria must be satisfied: a parent must certify in writing that the 50 hours of driving practice were completed; evidence of completion of a state approved driver’s education program must be provided; and documentation of enrollment in or graduation from high school or a GED program must be provided. Teen drivers applying for initial licenses must complete driving tests before a license will be issued. Teen drivers with initial licenses may drive alone, but are subject to the same curfews as drivers with instruction permits. For the first 12 months or until the driver turns 18, the driver may only have one passenger under the age of 20 in the car unless the passenger is a sibling or child of the driver. A full license at age 18. Teens who have held initial licenses for at least six months without moving violations can have a full license at age 18. 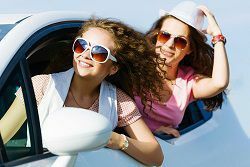 If a person aged 18 to 20 has not held an initial license for at least six months, then the person must complete a six-hour driver’s education course before applying for a full license. Full licenses are licenses without restrictions. Parents can also help their teens stay safe by creating driving rules and enforcing them with loss of driving privileges if those rules are broken. Teen driver are not automatically at fault for Illinois accidents. Instead, the same rules that apply to all drivers apply to teens. If you’ve been hurt, or if you’ve lost a loved one, then you are going to have to prove that another driver’s negligence caused the accident and resulting injury. For more information about how to do that and about how to protect your rights, please read our FREE book, The Ultimate Guide for Automobile Accident Victims, or start a live chat with us now.